It is hard to know what to make of Torsten Lauschmann’s show, and hard to know who made it. This is thanks to Lauschmann’s decision to show new video work and sculpture in the gallery’s main exhibition space, while turning Transmission’s dingy basement into a gathering place for a temporary community of self-selecting artist-musician-viewers. This experiment in bringing people together started on opening night, which, along with the free beer and gossip, incorporated a lengthy improvised music performance by Lauschmann, assorted Glasgow musicians and the people usually called an audience. Basing the performance on Dieter Roth, Gerhard Rühm and Oswald Wiener’s 1973 Selten Gehorte Musik, Lauschmann invited all in attendance to take up instruments and play, with one proviso: both musicians and non-musicians must play instruments they couldn’t play. Intended as an investigation of ‘the aesthetics of embarrassment, blamage and abstention’, the resulting cacophony became a collective essay in pride, praise and involvement. This outcome, possibly unexpected, fitted neatly with Lauschmann’s installation upstairs, itself an oddly welcoming ramshackle environment. The three new projected pieces each interact with this unsteady ecosystem on their own terms. A rural landscape—a grainy projection the full length of a wall— furthers the near-comic attempt to bring the outdoors in, partly obscured by the flickering shadows of the tree branches garlanding the space and enhanced by the soundtrack. A tangle of psychedelic polygons frame multi-angled views of figures running, seemingly fleeing in panic. This, needless to say, serves as a sharp counterpoint to the soporific, almost Arcadian context. Finally, a video piece projected onto a wall-drawing throws another spanner in the works, introducing a homely interior into the countrified gallery. 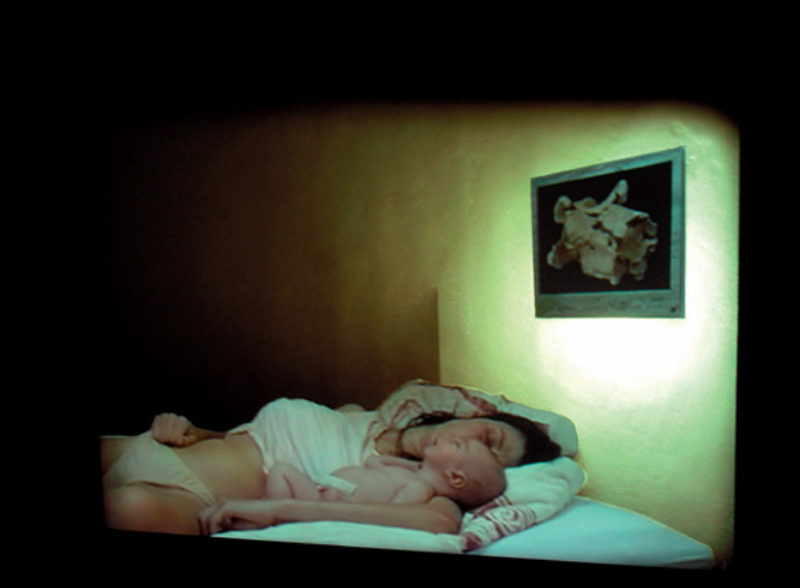 So still and calm it might easily have been mistaken for a photograph, the video (also displayed on Transmission’s stand at the Frieze Art Fair 2004) shows a woman and baby—Lauschmann’s partner, fellow artist Cathy Wilkes, and their child—asleep, deeply, on a bed. This is an ambiguous piece, which might be a document of post-partum exhaustion, an attempt to domesticate religious iconography or even a proud artist-father’s take on the traditional baby album. Whichever, the inclusion of this intensely private scene skews further the atmosphere of the gallery and adds to the sense that this is a generous show. The third strand in Lauschmann’s communitybuilding exercise was a programme of films screened in the basement. With off-cuts of carpet gaffer-taped to the concrete floor, comfy sofas and popcorn too, the space was turned into an ad-hoc living room for uninvited guests. The films themselves are a loosely collected history of avant-garde cinematic experimentation, ranging from Teinosuke Kinugasa’s 1927 opus A Page Of Madness, which employs a dizzying array of in-camera effects and editing innovations, to Charlemagne Palestine’s Island Song, which follows the musician singing along with his motorbike as he tours an island which ends in a yelped duet with a foghorn. Like Lauschmann’s own work in the room above, these often obscure selections sometimes gel with the show’s themes, sometimes counter them—Tony Conrad’s Cycle Of 3s And 7s, for example, explores alternative modes of composition and musicianship, while a dirt-cheap 1970s Turkish remake of The Wizard of Oz, sans subtitles, bemuses the audience with its sheer awfulness and refusal to even vaguely adhere to the plot of the original. Digested together, this three-in-one set of what might once have been called happenings makes for a teasing, often self-contradictory sequence of experiences, adding top-notes thatare odd, uncanny but never threatening, to foundations formed by the happily sentimental, cosy but never mawkish inclusion of an ever shifting cast of collaborators.